Born in Dublin, Tony Lynch travelled to London in his early 20s for work as a graphic designer and freelancer designer. It was here he developed his passion for photography and painting, drawn by the candid elements of life. His freelance work in London in the 60s brought him to many creative mediums including cartoon and illustration work. Life took Tony to Germany in the late 60s where he worked as a freelance designer and for graphic design agencies, eventually moving to Bern in Switzerland where he lived for a period. 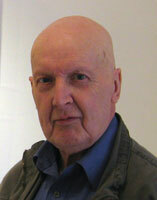 He returned to Ireland in the 1970s and in the following years studied at the National College of Art and Design. 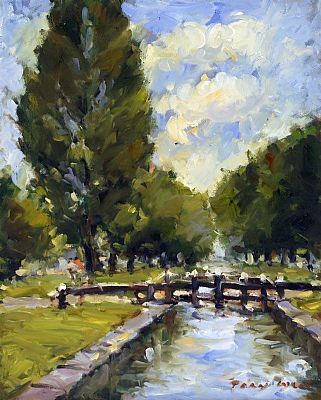 His freelance work allowed Tony the opportunity to paint more and to develop his passion for painting. In the late 80s Lynch pursued his desire to paint full time. His has exhibited widely in Ireland and his work is in many private and corporate collections. It is this moment of leisure in our lives, which Tony Lynch captures in his paintings. His luminous tones and exuberant paint marks express the many pleasures of time in the city. However his concern is not merely to portray the activity of the day but to express an ambience or significance of the city. Abstractions are drawn from concrete buildings and verticals lines; the paintings have a sensuous dialogue with the city. Like so many Irish Painters Tony Lynch came to painting late in life exchanging a career in graphic design for full time painting. His early career allowed him to explore many creative mediums. His experience working with photography granted him a knowledge that remains evident in his work. Images seems composed simply, yet Tony’s marked study of photography leaves a lasting understanding of composition, vertical bands of buildings are softened by people draped in pinks and reds offering a warmth to the composition. As an astute observer of modern life, Lynch’s paintings testify to a way of life, from the bicycles strewn restlessly at Trinity College to the idle gathering of people at leisure in the city, a way of life is recorded with marks of the brush. The theme of leisure continues to be associated with the impressionist period and their assertion to record the dandy, the bohemian and the ordinary in modern life. Lynch’s work maintains a link with this past. While his style demonstrates an understanding and draws reference from Impressionism, there remains relevance for today’s viewer. His painterly language of colour, rhythms and textures, express the same complex rhythm and colours of our contemporary city life. The work conveys a sense of pace and evenness of temperament. Lynch’s palette is dominated by infiltrated light, pale greys and blues combined with dappled light of ochre, pinks and yellow. The Irish climate and mood of the city are reflected in the rain washed streets, the moist air, evoking the softness of summer atmosphere. 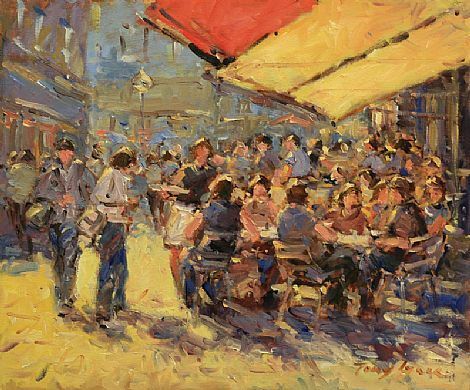 A myriad of brushstrokes and atmosphere are unified in the buzz of city life. In the simplicity of the composition is the authenticity and power of painting to encapsulate a moment, a landscape of modern life and leisure.